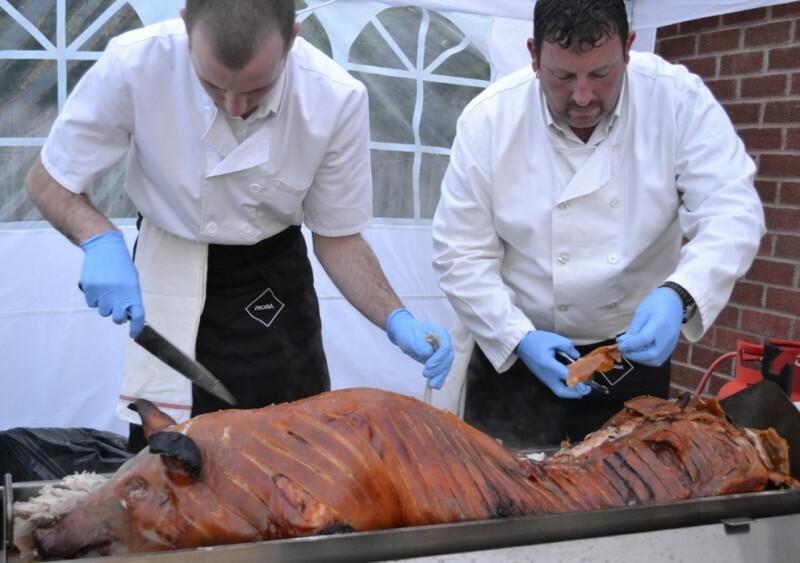 When it comes to creating a memorable menu for your event, nothing beats a traditional mouth-watering hog roast. If you’re looking to impress your guests with an exciting spread, then our hog roast catering service is the perfect choice. Our set packages or bespoke options are ideal for all types of gatherings, including weddings, anniversaries, birthdays, graduations, and corporate functions. Available throughout the East Midlands within a 30 mile radius of Leicester, our succulent and locally sourced meats are ready to provide a hog roast in Lutterworth that you won’t soon forget. Don’t worry if you’re on a budget as we’re competitively priced, with a range of packages to suit. Our fresh meat is all locally sourced so you can be sure of quality food, that doesn’t cost the earth. As well as a large selection of meats to choose from, we’re ready to compliment your main dish with a selection of sides and sundries. Offering tangy apple sauce, seasonal veggies, quality sage & onion stuffing and fresh bread rolls, we have everything you’ll need for a dazzling buffet. We can also cater for any dietary requirements, and provide meat-free options for your vegetarian guests. 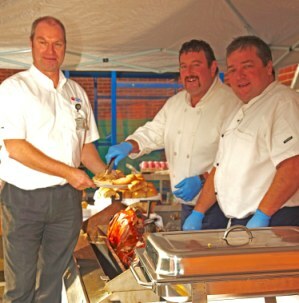 Enjoy your very own hog roast in Lutterworth, Broughton Astley or Market Harborough with our team of expert staff on hand, who are ready to provide a hassle-free catering service. 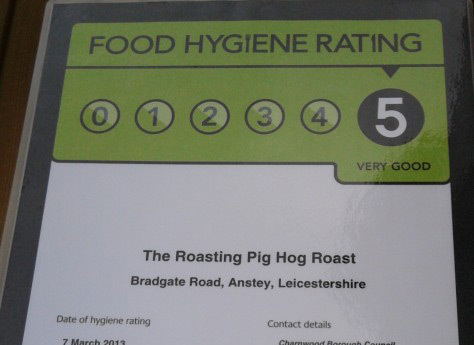 We boast a five-star hygiene rating, as well as extensive testimonials from our enthusiastic customers. 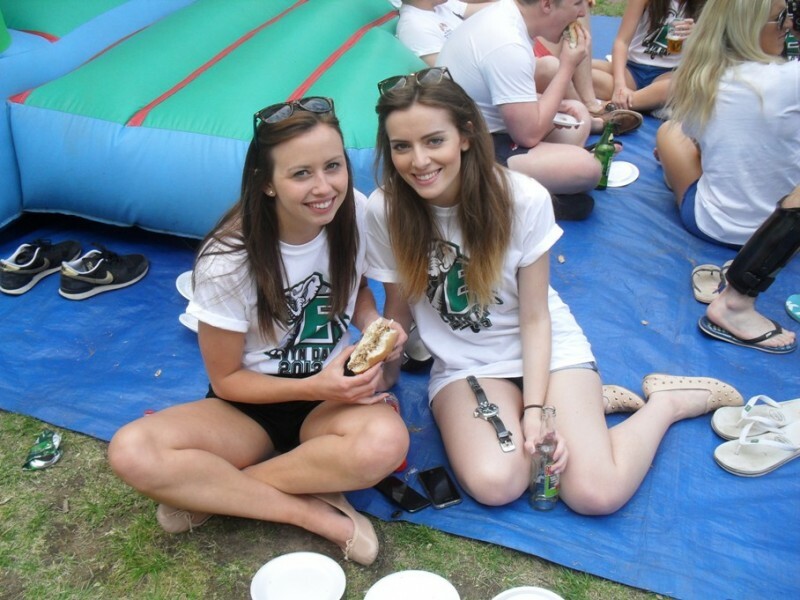 If you’d prefer to arrange a hog roast equipment hire, this is a service we also provide. We can both deliver and collect the hog roast equipment to your chosen venue, as well as provide a full working demonstration. We can also kit you out with cutlery, napkins, a gazebo, and even a 50kg hog to cook if you require. All you need to provide is the hungry guests. Please call our friendly team today on 0116 212 5259 for any further information. We’ll be happy to discuss our prices and options, as well as answering any questions you may have around our hog roast hire service.